Despite record high temperatures, the Father’s Day Bike Ride was a great event once again! Over 285 riders participated in the bike ride event, including raffles, breakfast and other activities — the perfect way to show Dad how much he means to you! Thanks Eli’s staff Sharon and Allyson for organizing the event and to Kristina, Antonio, Yadi, Danny, Irielys, Cassandra, Jessica, Diana, John Lyons David Jr., Eleanor, Diego and Julian for making sure the event went on without a hitch! We also thank the Chicago Police Department and Commander Looney who gave us over 14 cars and police on bikes, the Harwood Heights Police Department, the Chicago Bike Ambassadors, Oak Street Health For the Water, Rudy’s Bike Shop and Alderman Sposato. Join us for a sweet break this summer with special events around Chicago! Eli’s Cheesecake’s 18th Annual Farmer’s Market: Thursdays, June 14th – August 30th from 7:00 a.m. to 1:00 p.m. The Eli’s Cheesecake Company will host its 18th annual Farmer’s Market this summer on Thursdays from June 14th to August 30th at 7 am-1 pm on the lawn at Eli’s Cheesecake World, 6701 West Forest Preserve Drive (intersection of Forest Preserve Drive, Montrose and Normandy) in Chicago’s Dunning neighborhood. The market will offer a great selection of the freshest locally grown fruits, vegetables, herbs and flowers from Nichol’s Farm as well as artisan-prepared foods and crafts made by local not-for-profit partners, including neighboring New Horizon Center for the Developmentally Disabled and The Chicago High School for Agricultural Sciences (CHSAS), who bring produce and crafts from the farm on their school campus. Lunch is available al fresco: Eli’s chef shops the market and grills a Summer lunch special from 11am-1pm each day of the Market. Prices range from $6.95-$9.95. July 11-15th – Stop by the Eli’s Cheesecake booth at the corner of Jackson and Columbus and enjoy the famous Chocolate Chip Crunch Dipper® (frozen Chocolate Chip Cheesecake on a stick, dipped in crunchy dark chocolate on a stick), Original Plain Cheesecake, Turtle Cheesecake, Cookie Cheesecake Smoosh Made with Oreo® Topped w/Vanilla Ice Cream & Chocolate Sauce, and Lemon Mixed Berry Cheesecake. July 14th–Celebrate the 38th birthdays of Eli’s Cheesecake and Taste of Chicago: Look for the BIG CAKE IS HERE tent on Saturday July 14th at 12:30 pm at Buckingham Fountain in Grant Park, Chicago. 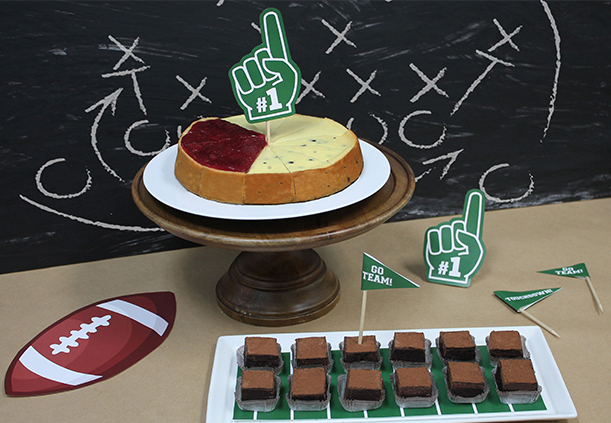 Enjoy a FREE slice from the BIG 1,000 pound Eli’s Cheesecake (while supplies last). Cheesecake Slice decorating, two locations! July 26 (Thursday) at the Eli’s Farmer’s Market. 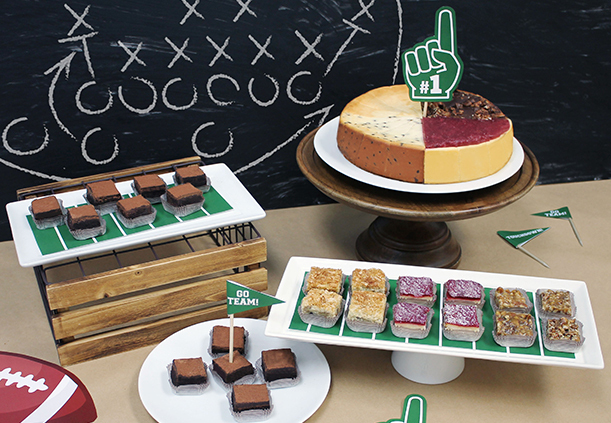 Complimentary continental breakfast* 8-10am and cheesecake and dessert samples all day. Musical entertainment to be announced and July 27 (Friday) – Eli’s Cheesecake at O’Hare United Terminal 3 near the dinosaur from 12pm-2pm. July 28 (Saturday) – Eli’s culinary team will teach you how to make Cheesecake Cannoli and Cheesecake Sandwiches, as seen in the O List, Valentine’s edition. Visit our annual Classic Car Show with over 100 vintage cars from 9am to 4pm. Lunch on the Grill available for purchase. See The Happiness Club, The Jesse White Tumblers flying over a giant cheesecake and enjoy cheesecake bingo, cheesecake hula hoop contest, cheesecake eating contests, take a photo with Eli’s Big Slice mascot and more 9am-4pm (schedule to be posted). Taste cheesecakes samples all day! Follow #ElisMobile on twitter to discover where the Eli’s Cheesecake Mobile will be handing out FREE slices around Chicago and meet and greet Eli’s mascot Big Slice and Eli’s big cheese, Marc Schulman. 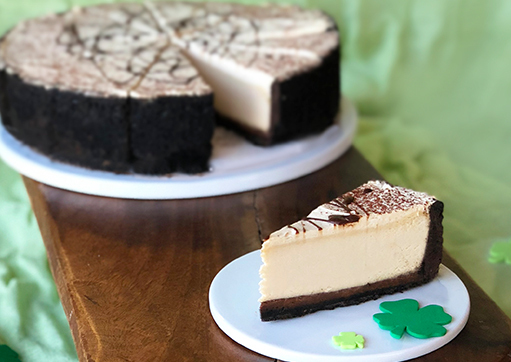 Enjoy a FREE slice of Eli’s Cheesecake all day at Eli’s Cheesecake Bakery Cafe and try a special made-to-order dessert: Eli’s Smoosh®, cheesecake ice cream combo, Eli’s Dippers®, frozen cheesecake on a stick, dipped in chocolate, or make-your-own Eli’s Cheesecake Topping Bar. In honor of National Cheesecake Day, special savings on your entire frozen dessert purchase. August 9, 16 & 23 – Sweet Taste of Summer: Eli’s pastry chef, along with a different celebrity guest each week (Candid Candace and Roxana’s Kitchen) will show you how to create a unique Summer dessert, using freshly picked fruits and vegetables from the Eli’s Farmer’s Market. 10am. August 23 – Eli’s Drive for School Supplies: For over 12 years, Eli’s Cheesecake has supported its neighbor, New Horizon Center for the Developmentally Disabled, by donating school supplies to its students. Bring a school supply and get a free slice of Eli’s Cheesecake! 7am-1pm. August 26th – Celebrate the 200th birthday of the Illinois Constitution with statewide birthday cheesecake! In partnership with the Illinois Office of Tourism, enjoy Eli’s Cheesecake all across Illinois: a BIG cheesecake at the official celebration in Springfield, and at Convention & Tourism Bureaus throughout the state. Times and locations TBD, Visit https://illinois200.com. For more information about farmers markets, or any of the activities, call Eli’s at 773-736-3417 or visit the Eli’s website at www.elicheesecake.com.